Brentford station is to lose its fast service to Waterloo when train operators SWT reorganise their timetables in December. 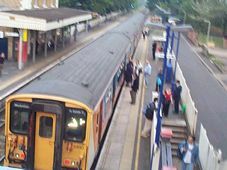 BrentfordTW8.com has learnt that SWT are to totally change their services at the end of the year. This will see the present semi-fast service to Waterloo replaced by a stopping service, adding 10 minutes to journey times into London. The timetable reorganisation will benefit other stations along the line, where services will double in frequency during off-peak hours to a train every 15 minutes. SWT are still in discussions with the Strategic Rail Authority about providing a similar service during peak hours. The train operators are confident that the SRA will fund these services - if they don't, stations will see a worse service at the busiest times of the day, with trains continuing to stop at thirty minute intervals. Fast services to Reading will be re-routed through Richmond, meaning that they are unable to stop at Brentford. SWT chose Brentford as a destination for the semi-fast services following the rebuilding of the station, partly funded by GlaxoSmithKline. The new timetable will run from Mondays to Saturdays, with no improvements to the hourly service on Sundays. Car Club to set up in Brentford? The news comes as local passengers have got official confirmation of something they probably knew already - local trains run consistently late and are extremely over crowded. A new report from the SRA shows that South West Trains have once again produced the most tardy service. One in four trains is delayed by more than five minutes and it is even worse at peak times. The company was fined more the £10 million during the year because of the late operation of their trains. The news for South West Trains users was not much better on over-crowding. During the morning peak the trains operated at an average of over 7.4% over-capacity the worst of any London operator in 2003. This fell to 2.8% in the afternoon peak but this was still above any other network. South West Trains also performed poorly in terms of handling complaints. Their complaint handling procedure allows them 15 days to respond compared to 10 days for most other London networks but in the latest quarter they only answered 65% of complaints on time - the worst performance of any London network. SRA Chairman, Richard Bowker said: "Passengers can feel reassured at the record level of investment in Britain's Railway over the past year. They will now want to see the industry redoubling its efforts to ensure that the performance of the railway fully reflects this unprecedented level of support."